Audinate has made Level 1 of the popular Dante Certification program available online. This online course allows customers the opportunity to become certified any time or place, without the need to attend in-person events. 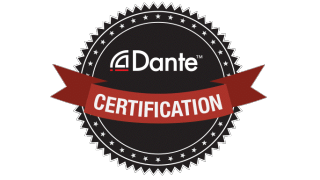 Audinate created the certification program as a response to requests for information about best practices for installing Dante audio networking. The Dante Certification program provides an easy way for system designers, engineers, and others in the industry to learn about Dante with in-depth training. The certification program also allows them to demonstrate Dante expertise to potential employers and clients. The certification program currently has two levels: Level 1 is available both in person and online, and Level 2 is currently only offered in person. Level 1 Certification tests proficiency of basic Dante audio networking concepts, covering audio networking fundamentals, basic networking concepts, creating a small-scale Dante network, and using Dante Controller and Dante Virtual Soundcard. The course consists of five videos and a 40-question test, and can be completed in less than two hours. Upon completion of the course, participants will receive a certificate and the use of the Dante Certification logo for their website, business cards, and more. They will also be registered in Audinate’s internal database of certified professionals that tracks the levels of certification completed.